This entry was posted on August 14, 2014 at 11:03 am and is filed under 1980s, Heavy Metal, Heavy Metal and the 1980s, Music, Rock, Uncategorized with tags Bloodstock, British, British Steel, Classic Rock, hard rock, Heavy Metal, Heavy Rock, Judas Priest, Megadeth, Point of Entry, Saxon, Screaming for Vengeance, The 1980s, Turbo. You can follow any responses to this entry through the RSS 2.0 feed. You can leave a response, or trackback from your own site. I agree. I think it’s a good album. I consider it “British Steel Lite” if you know what I mean. I know what you mean and it’s a very good analogy. I’ve always enjoyed POE. There’s a couple of forgettable songs on it but a few classics as well. Heading Out to the Highway and Desert Plains are two of the best songs they ever did. I’m going to have to listen to Desert Plains again for sure. There are some good classics JP songs on here. A lot of those POE songs were much better live too. Actually this is the first Priest record I ever purchased when it came out . Screaming….is my all time fav Priest but POE is right behind it. Sure it’s British Steel Lite but for me personally since it was my first Priest purchase it has stuck with me all these yrs later. I can listen to this album still front to back so yeah I guess u could say I’m a huge fan boy of this record! I know for some they were chasing perhaps airplay with more than a few tracks on here but man I dunno I just dig this record thru and thru…. You’re very welcome. I think for most people, Screaming for Vengeance is the absolute favourite. They were probably going for a bit more airplay with POE and I’m glad that so many like yourself seem to like the album so much. Underrated album. 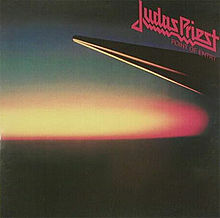 Not my number 1 favorite but we’re talking about Judas Priest, most of their albums could be your favorite. I think this is kind of like Saxon’s Power & Glory… good, underrated, only looks bad because other Saxon albums are so good. Very good point, it’s not their best but it’s a lot better than what people give it credit for. I totally agree with you on that one Manny.